"After the 2016 US presidential election, social media came under scrutiny like never before, and what’s since come to light hasn’t been pretty: widespread consensus that foreign government-backed groups used platforms like YouTube, Twitter, and Facebook to spread discord and division among the American public. In their new book, P. W. Singer and Emerson T. Brooking make the argument that what we witnessed was a new form of global conflict, in which there are no bystanders. 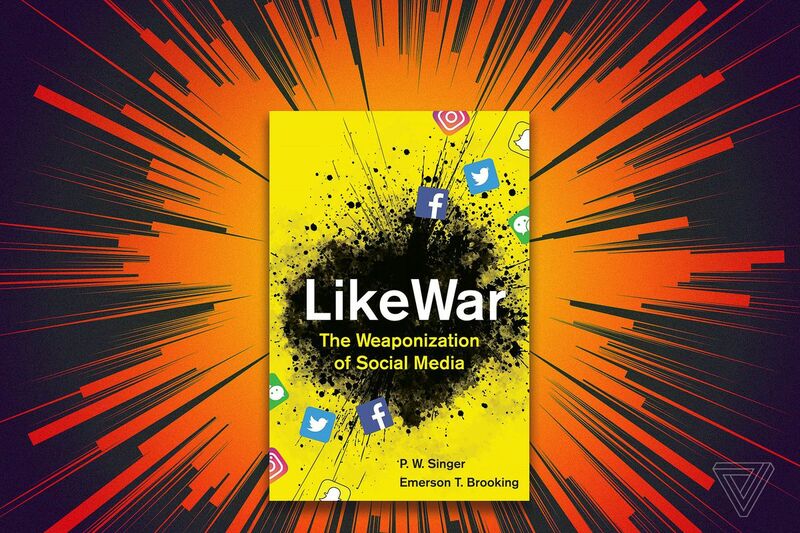 LikeWar: The Weaponization of Social Media is a look at the role social media plays in modern conflict. Singer has written extensively about the future of warfare, looking at robotics (Wired for War), cybersecurity (Cybersecurity and Cyberwar: What You Need to Know), private military companies (Corporate Warriors: The Rise of the Privatized Military Industry), and even speculative fiction (Ghost Fleet: A Novel of the Next World War). Now, he turns his attention to what warfare looks like when information can spread around the world instantly. Singer and Brooking look at how groups like ISIS have used platforms like YouTube and Twitter to spread their message around the world, taunting their opponents and enticing new recruits, while bad actors like Russian-backed groups found ways to game Facebook’s design to spread misinformation and lies..."